In preparation for ifarm’s Knitting Night, we thought we would honor the politicized knitting circles of the Daughters of Liberty, which helped boycott British goods throughout the American Revolution. 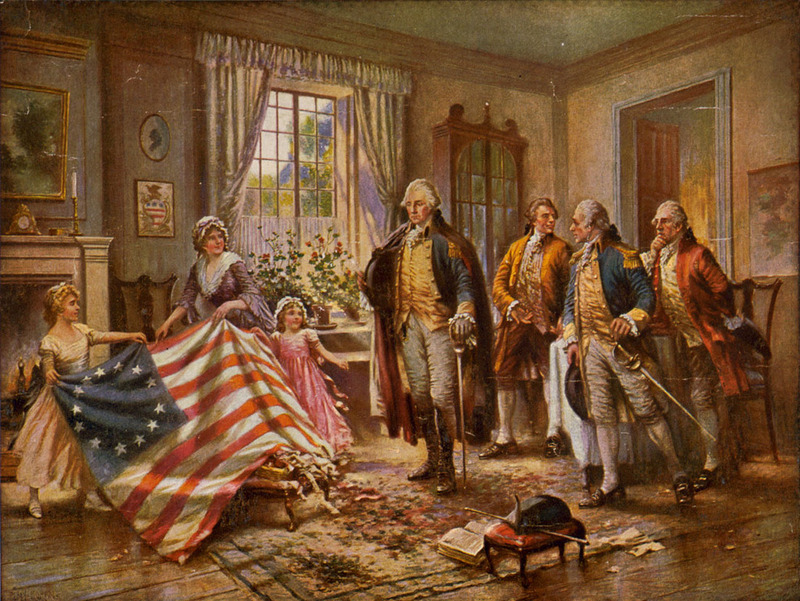 Their simple act of knitting was a part of the backbone of civil disobedience behind the American Revolution. Alongside many other important roles (including spying, secret soldiery, and nursing) these women literally clothed the revolution in homespun (x)(x). The British recognized the value of wool in the colonies very early- they passed the Wool Act in 1699, seventy-five years before the Revolutionary War. The Wool Act of 1699 forbade the Colonists from selling wool, wool yarn or wool cloth outside of the colony where it was produced, and restricted wool imports to British wool. The Wool Act also increased the taxes of the Colonists (wool was taxed upon import and export) and by restricting the markets where they could sell their wool it reduced their potential profits. It essentially curtailed colonial wool purchases and sales to give an advantage to British businesses. The Wool Act was one of the milestones towards the American Revolution. It sparked the first mutters of civil unrest and boycotting. Women began spinning more of their own wool rather than pay the fees imposed on British goods. The nail in the revolutionary coffin came when King George II began heavy taxation of the colonies to pay for the immense costs of the French and Indian War (x). In two years Parliament passed the Sugar Act of 1764 (taxing sugar), the Currency Act of 1764 (outlawing colonial currencies), The Stamp Act of 1765 (taxing official documents), and the Quartering Act of 1765 (requiring colonists to quarter British soldiery). The Acts all supported British supremacy and tried to restore the solvency of the East India Trading Company. When the Sons of Liberty was formed to boycott English goods and resist the Stamp Act, colonial women answered with the Daughters of Liberty. The Daughters vowed to forgo all British products and instead spin, weave and knit all of their families clothing and wear nothing but homespun. “Spinning Bees,” community gatherings to spin yarn, became politicized meetings. 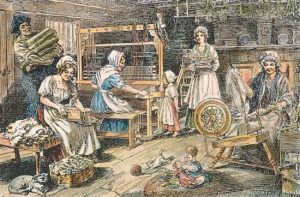 The amount of thread and yarn spun at the spinning bees was often published in the local papers, as towns and congregations established homespun production rivalries. Wearing homespun became a political statement. 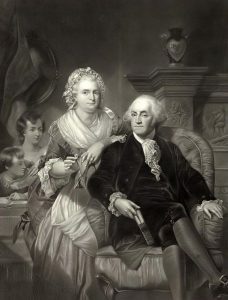 At the first commencement of Rhode Island College (later Brown University) in the 1760s, the president proudly wore homespun clothing while conducting the ceremony. At Harvard, the faculty and students all wore homespun clothing (x). These revolutionary “spinsters” recognized the political power of seemingly small actions: The Daughters of Liberty and their homespun movement was an important part of the road to revolution. Their production and thrift purloined British profits, clothed the revolution, and also provided inspiration for Mahatma Gandhi’s own homespun movement, this time for Indian independence, almost 150 years later. ifarm is hosting our own knitting circle this January 19th. We will be knitting in the restored Towne farmhouse. All genders, creeds, and knitting levels are welcome.